The Jason Witten Collegiate Man of the Year, presented by Albertson’s/Tom Thumb, is awarded to the Football Bowl Subdivision player who best demonstrates an outstanding record of leadership by exhibiting exceptional courage, integrity and sportsmanship. Dixon, a senior safety from Wisconsin, is a three-year starter, who was named first-team All-Big Ten last year. He began the 2018 season on the watch lists for the Bednarik Award, Nagurski Trophy and Wuerffel Trophy. A multiple-semester Dean’s List student, Dixon has been named Academic All-Big Ten each of the last two seasons and was a Big Ten Distinguished Scholar last year. He graduated with a bachelor’s degree in rehabilitation psychology. The youngest of four children, Dixon is a product of the foster care system. He has volunteered his time at more than 30 events through the Badgers Give Back community service initiative and has long been one of the group’s most dedicated volunteers across all sports at UW. Dixon was chosen as the recipient of the award among three finalists, which also included Auburn’s Derrick Brown and Kansas State’s Dalton Risner. 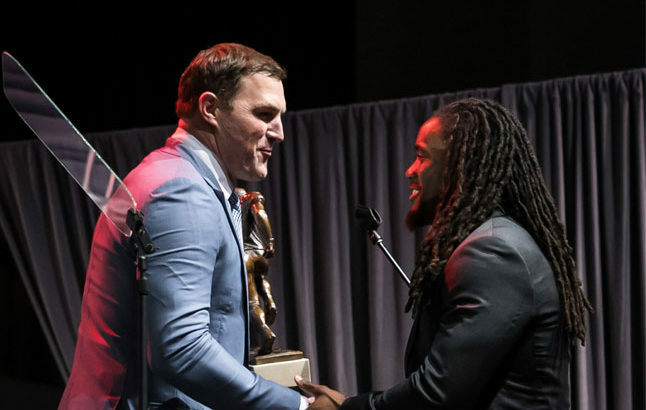 The Jason Witten Collegiate Man of the Year, presented by Albertsons and Tom Thumb, is the first college football honor to focus primarily on a player’s leadership, both on and off the field. The inaugural award was presented to UCF’s Shaquem Griffin last February. Griffin led his team to an undefeated season in 2017 and became one of the most inspirational stories in all of sports. A $10,000 contribution will be made in Dixon’s name to Wisconsin’s athletic scholarship fund. The contribution will be made by Jason Witten’s SCORE Foundation, the official charity of Jason and his wife Michelle. The SCORE Foundation, founded in 2007, has positively impacted tens of thousands of children and families in Texas and Tennessee over the last 11 years. The foundation operates its nationally-recognized SCOREkeepers program, which places trained male mentors on staff to work with children at family violence shelters, at nine shelters in the two states.